Anna, Yenni (2007) Perkembangan Alat Ukur Kreativitas. (Studi Pada Mahasiswa Teknik Jurusan Arsitektur). Skripsi thesis, Universitas Tarumanagara. 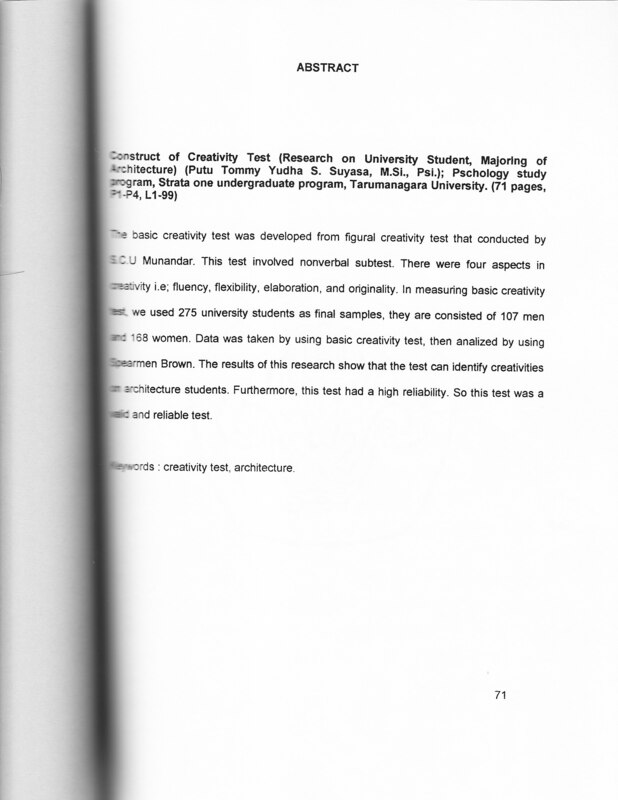 The basic creativity test was developed from figural creativity test that conducted by S.C.U Munandar. This test involved nonverbal subtest. There were four aspects in creativity i.e; fluency, flexibility, elaboration, and originality. In measuring basic creativity test, we used 275 university students as final samples, they are consisted of 107 men and 168 women. Data was taken by using basic creativity test, then analized by using Spearman Brown. The results of this research show that the test can identify creativities on architecture students. Furthermore, this test had a high reliability . So this test was a valid and reliable test.